– Depending on your own situation/location, it is YOUR call whether or not your student attends school. If you cannot make it in, simply let school get underway in the morning and call in later in the day to excuse your students absence. -The biggest problem areas will be our parking slots. With all the moving of the snow, we have lost many parking spaces. PLEASE TAKE YOUR TIME AND MOVE SLOW IN THE PARKING LOTS! 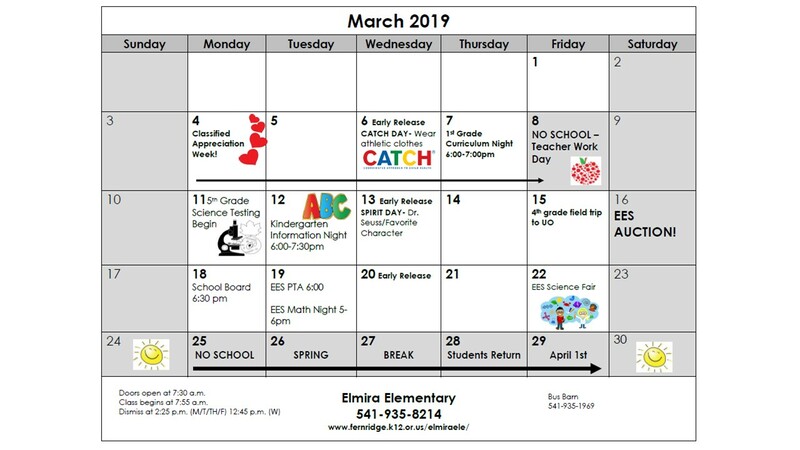 Elmira Elementary is excited to offer an evening of information for our incoming Kindergarten families. In Kindergarten, students develop a love for learning. They begin to feel comfortable in a new environment as they advance their basic skills such as working with others, listening, and sharing. Throughout the year, students will expand their academic skills in reading, writing, and math. 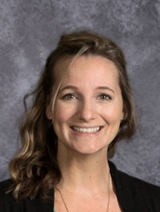 Elmira Elementary strives to give parents and students the right start in education by caring for and understanding each child’s needs and each parent’s concerns. We encourage parents to contact us whenever they have questions or concerns. 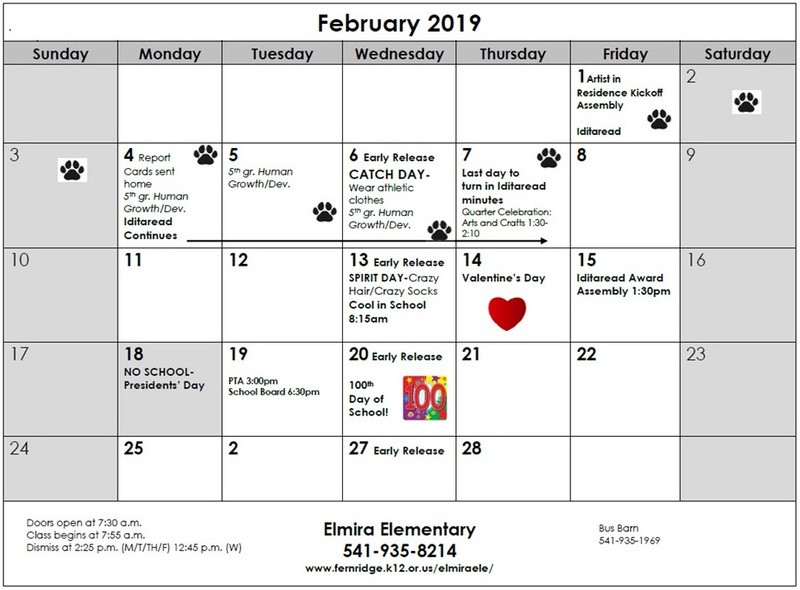 Just a quick reminder our February PTA meeting is this Tuesday, 2/19, at 3 pm in the EES Library. 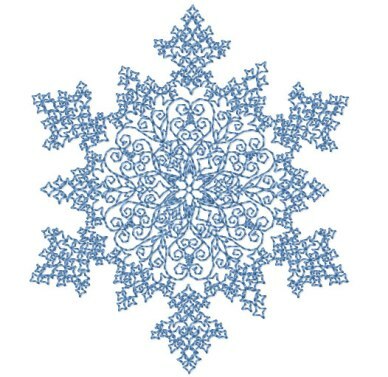 There will be a drawing for a $10 Hillbilly Brews gift card! We’ve got lots of things coming up with PTA!! Our biggest fundraising event of the year is coming up on Saturday, March 16th! The Raffle Ticket Packets went home with kiddos on Friday (if not, then this coming week) & each packet contains 25 tickets. If you need more, they are available in the front office. Please be sure to follow the ticket instructions to ensure all tickets purchased qualify for the drawing. Check out the event page on Facebook to see this year’s prizes. We are still collecting Box Tops for Education! There is a contest going for the classroom with the most Box Tops turned in by Thursday, February 28th. The winners will receive a class party sponsored by Dairy Queen!! There are extra collection sheets in a pocket on the PTA bulletin board in the front hall of the school or on www.boxtops4education.com . Be sure to put your child’s name & teacher on each sheet. 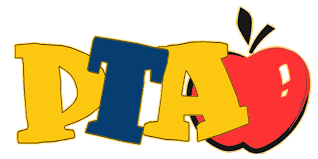 -April PTA Meeting will be Tuesday, April 15 at 6 pm in the EES Library. -The Spring Bazaar will be the last Saturday in April, the 27th. More details to come! Be sure to like and follow our PTA Facebook page for updates. Also, Iditaread was fantastic this year!! Thank you to Alison & Shahalie for all your hard work and all the “minute counters” for making this literacy event such a success! And THANK YOU families, teachers & staff for helping our kids to reach their goals & nurture a love for reading! Thank you everyone for your continued support & look forward to seeing you on Tuesday! Elmira Elementary OBOB- Congratulations to The 5 Steins! Congrats to our winning EES OBOB team The 5 Steins! We had 6 teams battle within the school for the opportunity to represent EES at the OBOB Regional Tournament! Lots of hard work, dedication, and reading! Great job to everyone! 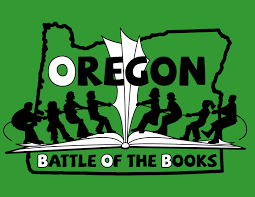 All of our OBOB participants are invited to the EES vs VES Battle on February 28th- Parents please look for permission forms to come home next week. 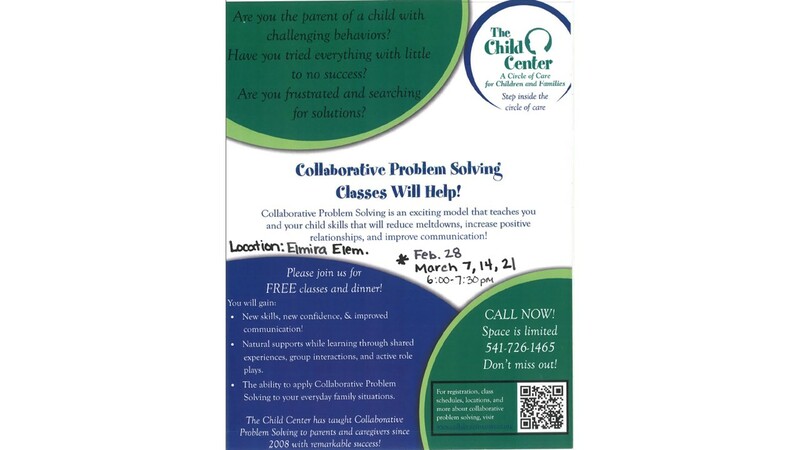 The Child Center is presenting a series of four classes for parents on collaborative problem solving. Collaborative problem solving is an exciting model that teachers you and your child skills that will reduce meltdowns, increase positive relationships, and improve communications. Parents with child in elementary school or middle school will find the strategies used in collaborative problem solving useful and effective. If you are struggling with your child’s challenging behaviors or are frustrated and searching for a more effective way to manage your child’s behavior, then collaborative problem solving could be what the solution you are looking for. The classes will be held on Thursdays at Elmira Elementary School from 6 PM to 7:30 PM starting February 28th. Dinner will be served and childcare provided during the class. Space is limited so if you are interested call 541-726-1465 to register.